N.B. Teddy Roosevelt (in 1912) and Woodrow Wilson (in 1924) also served as president of the American Historical Association. N.B. 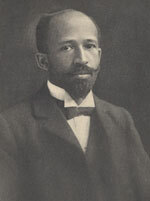 (1) DuBois was also the first African-American to receive a Ph.D. from Harvard (in History). (2) Before becoming Speaker of the House, Newt Gingrich also earned a Ph.D. in Modern European History from Tulane University and taught history at Western Georgia College. N.B. Michael Palin is not the only member of Monty Python with an interest in history. Terry Jones has written on the history of chivalry and has hosted a History Channel series on the Middle Ages. 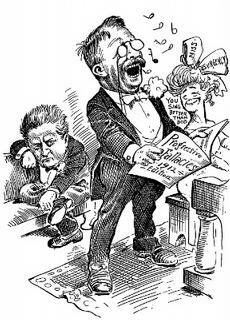 IMAGES, FROM TOP : (1) 1912 Political cartoon featuring historian and presidential candidate Teddy Roosevelt - From The College of New Jersey's collection, "Images of American Political History"; (2) W.E.B. DuBois (1868-1963), historian, sociologist, and civil rights activist - From the Northwestern University Library; (3) Martha Stewart -- from Martha Stewart.com; (4) Steve Carell, star of The Office - From NBC.